Erin Miller | Galion Inquirer Colonel Crawford freshman Drayton Burkhart sends a pitch to the plate during Wednesday’s home contest against the Bucyrus Redmen. Burkhart earned the win on the mound and also recorded three hits at the plate in the Eagles’ 5-4 victory of their conference foes. NORTH ROBINSON — On Wednesday, April 18, the Colonel Crawford Eagles baseball team welcomed the visiting Bucyrus Redmen to Marion E. Althouse Field for a meeting between Northern-10 Athletic Conference foes. The visiting Redmen got on the board first in the opening frame, manufacturing a run after a single, a stolen base and a fielder’s choice put a runner at third. After a flyout to left field, that lead-off single tagged up to put Bucyrus up 1-0 heading into the home half of the first. Despite singles by Drayton Burkhart and Chase Walker, the Eagles remained scoreless heading into the second. In the second, both teams would go hitless in their respective parts of the inning. The top of the third would see the Redmen notching two more hits but both runners would be left stranded on the base path by the Eagles’ defense. At the plate in the third, the home team would go down in order and head into the fourth still trailing; 1-0. Bucyrus would put another run on the board in the fourth, after a lead-off single and a sacrifice bunt put a runner in scoring position at second base. A flyout would give Crawford two outs but the next batter would bloop a single into left to score run number two for the visitors. The Eagles would respond in the home part of the inning when Burkhart singled to start the rally, his second hit of the contest. Walker would belt a double, scoring Burkhart and the Eagles were on the board. Walker would later score on an error by the Bucyrus shortstop on a ball hit by Caleb Lohr. Daylen Balliett, who reached on a single earlier in the inning, would eventually score the third run for the home team on a walk to Trevin Fairchild. Brock Ritzhaupt would strike out looking to end the bottom of the fourth and leaving the bases loaded. Walker would score again for Colonel Crawford after the Redmen went in order in the top of the fifth. Bucyrus committed two costly errors in the fifth to allow the Eagles to go up by a score of 4-2. A wasted hit is all that the visitors mustered in the top of the sixth while three hits led to another Eagles’ insurance run to put them up 5-2 heading into the potential, final inning. In the seventh, after two walks by Burkhart, he was replaced by Spencer Mutchler. Mutchler, inheriting the runners on first and second, would see the bases go loaded after an error by second baseman Ritzhaupt. A flyout to first gave the defense one out with the bases still loaded but a two-RBI single would change that and Bucyrus would inch closer with the score now 5-4. Mutchler would then strike out the next two Bucyrus hitters to clinch the 5-4 conference victory for the Eagles. With the narrow victory, Colonel Crawford improves to 4-7 overall on the season and 2-6 in the N-10. Bucyrus drops to 4-6 overall and stumbles to 1-4 within the league. Burkhart earned the win on the mound for the Eagles, going six innings and allowing six hits and charged with four runs. Burkhart struck out one and walked five on the day. Mutchler was credited with the save, allowing one hit and striking out two while working the seventh inning. Burkhart helped his cause at the plate, recording three singles and two runs scored. Walker also came up big for the home team at the dish, ripping a pair of singles, a double, scoring two runs, driving in a run and stealing a base after reaching on an error in the fifth. Balliett also finished the day with a pair of singles, a run scored, a run driven in and a stolen base in the victory. Rounding out the offesnse for Crawford was Mutchler, recording a single and an RBI and Fairchild with a run batted in. The Eagles will be on the road for the rubber match against the Redmen on Thursday, April 19 before heading to Ridgedale for an N-10 battle with the Rockets on Friday. 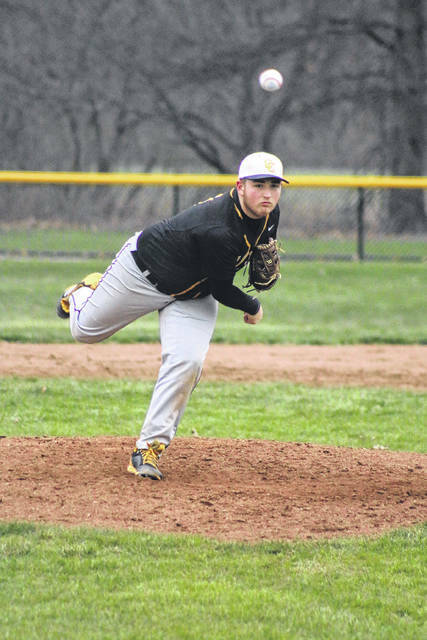 Crawford is set to be back home and will host the Crestline Bulldogs for a doubleheader on Saturday, April 21.
https://www.galioninquirer.com/wp-content/uploads/sites/38/2018/04/web1_Burkhart-pitching.jpgErin Miller | Galion Inquirer Colonel Crawford freshman Drayton Burkhart sends a pitch to the plate during Wednesday’s home contest against the Bucyrus Redmen. Burkhart earned the win on the mound and also recorded three hits at the plate in the Eagles’ 5-4 victory of their conference foes.